At this point, much is being made about the failure of the Patient Protection and Affordable Care Act, better known as ObamaCare. President Obama himself tacitly admitted as much by calling in what amounts to an emergency rescue squad from Silicon Valley to try and make sense of the dysfunctional website...paid for by the American taxpayers at a staggering cost of over $500 million. The website itself was granted to a company with connections to Obama backer George Soros, CGI Federal in a no bid contract, and the job they did was so amateurish and sloppy that they even opened the government to a lawsuit for violating the licensing agreement of a copyrighted web script used by the site. The estimated cost to repair the system and get it up and running again may run as high as $2 billion, and it might take months to repair. Meanwhile, Americans coast to coast are experiencing sticker shock over the huge increases to their existing healthcare policies, and the demographic ObamaCare targeted to pay the freight - largely uninsured healthy young adults - is steering clear as they discover what enrolling in ObamaCare actually entails. Let's look at the math. They're offering coverage for $1,572.00 per year that only kicks in after you pay $6,350, not a sum the majority of under 30s still paying off student loans have laying around even if they happen to have full time jobs. Any wonder that healthy young adults aren't signing up, and opting to pay the tax instead? And without their participation, ObamaCare is doomed to failure. And it gets worse. Even if the president's team ever gets the website fixed to allow people to enroll in one of the new exchanges, your insurance could turn out to be worthless. Most HMO and PPO plans today understand that if one of their insured is facing a catastrophic emergency like a car accident or a heart attack where immediate medical treatment is necessary, a locally available 'out of network' doctor or hospital might have to be used at times and they will cover that care. 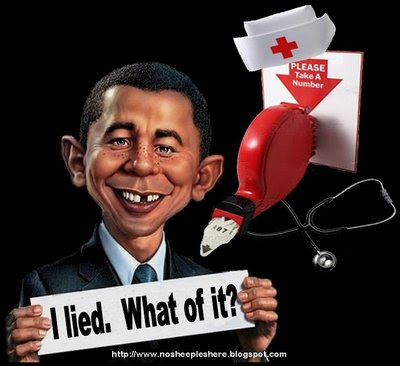 Because ObamaCare does not allow any payment at all to to out of network physicians or hospitals who do not accept ObamaCare, a steadily increasing group, a single medical emergency could end up costing a person with ObamaCare insurance thousands of dollars. There are significant voices on the right end of the spectrum who are saying that the best policy is simply to allow this debacle to happen. The strategy they're touting assumes that when this happens, both President Obama and the Democrats will be blamed for the colossal and expensive failure and it will all end up collapsing and eventually being repealed anyway. They're missing two important factors. First, no federal entitlement has ever been repealed.They just morph into something different in the name of 'reform'. And that brings us to the second factor, the dirty secret behind ObamaCare - it was always designed to fail. President Obama and his minions always had the goal of Sovietizing the American health care system by making it single payer and having it controlled solely by the Federal government. ObamaCare was never anything more than a poorly constructed Potemkin village designed to fail so miserably that the American people would demand single payer just to get rid on the unwieldy mess ObamaCare would create.